Please welcome today's paranormal guest author Suzy Turner! 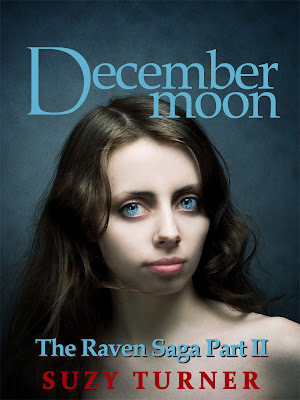 Suzy, author of Raven and December Moon , has prepared a special guest post for our readers. Howling deep into the night by the light of a bright, white, full moon. You can almost see him sitting there, his head tilted back as he makes that high pitched sound that sends shivers down your spine. Yes, I'm talking about the elusive werewolf. If they all looked as gorgeous as Jacob Black, then we wouldn't be at all afraid would we? I know, I know, I'm far too old to be attracted to Jacob (at 35, I'm almost old enough to be his mother!) but it's impossible not to be. He is a fine figure of a man (or a wolf, rather) though, isn't he?! I'll stop talking about Jacob now, this is a post about werewolves after all. I think I was first introduced to the idea of werewolves back in the 80s when I saw a really silly film with Michael J Fox called Teen Wolf. It obviously planted a seed in my mind because since then I've rather enjoyed reading about them in books or watching werewolf stories on screen. An American Werewolf in London is another, albeit, rather more gory version that I enjoyed as a child (admittedly, I have seen it since and found it disappointing). So, come back to present day and what kind of werewolf flicks / books, are all the rage? Twilight obviously comes up trumps but have you seen The Lost Girl? There is a rather gorgeous character called Dyson (played by Kristen Holden-Ried) who plays the smouldering werewolf to fabulous effect. Being Human is another featuring a werewolf, a ghost and a vampire all living under the same roof. A few months ago I read my first book centered entirely around werewolves. It was called Blood and Chocolate and I have to say, it left me a little disappointed. Although the story was excellent, I found the main character irritating, especially the way she kept referring to people as boy or girl. She was supposed to be 16 yet came across as much older than her years. But the werewolf aspect was fantastic. In December Moon, as in Raven, there is one main werewolf. His name is Zoltan and he is your stereotypical wolf man. He's a tough guy who wants nothing more than a good fight. Having said that, Zoltan is a big softy at heart, especially when it comes to his girlfriend, Tabitha, who just happens to be a changeling... with the ability to change into a mountain lion. If I've tempted your taste-buds, why not check out December Moon. I'm sure you won't be disappointed! On her 15th birthday, December Moon discovers she is the descendant of a family of witches, kept in the dark her entire life in an effort to protect her. But when Lilly, her best friend, finds herself in danger from one of the world's most evil vampires, December will do everything in her power to stop him. December Moon is a fantasy novel for children and young adults set in BC, Canada. To learn more about Suzy Turner and her books, please visit her website or check out E.J. 's interview of Suzy here at From the Shadows. 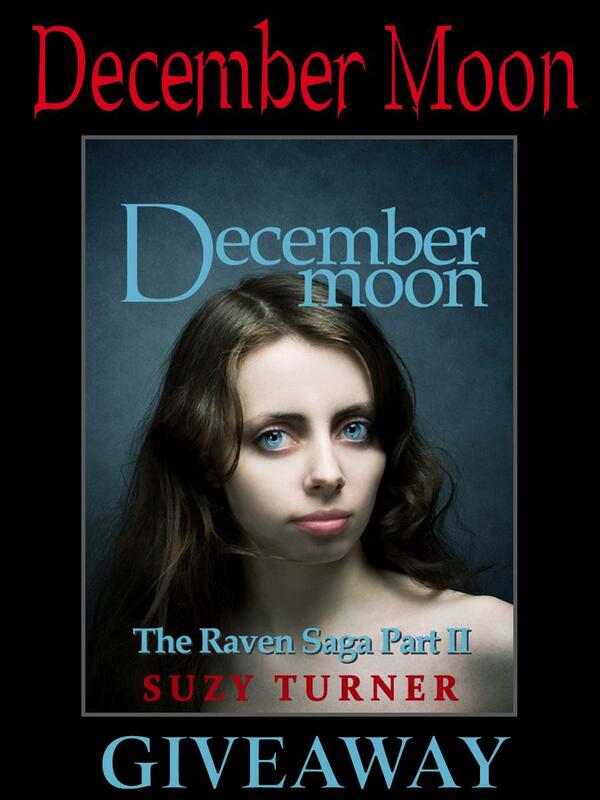 We are giving away two copies, one paperback and one ebook, of December Moon (The Raven Saga #2) by Suzy Turner. To enter, please leave a message on this post including your email address (so we may contact you if you win). You do not have to be a follower to enter (though I always appreciate a follow!). This giveaway is INTERNATIONAL. Giveaway ends October 1st midnight EST. Oh, love the cover and interested in reading the interview. Count me in! This cover is so haunting, it just draws me in! This is my kind of book i love wolves, so you had me at that. I haven't read the Raven so i must get that one in there on my must read list. Thanks for the post. Looking forward to reading these books.. This looks like a wonderful read! What a great find. I so love this blog! Yay! Thanks for this giveaway! I've always wanted to read this. Suzy, I'm a tiny bit *cough, cough* older than you and I, too, think Jacob is a fine figure of a man/wolf! Awesome guest post!! I'm even more interested to read your book than I was before, and I was REALLY interested before! I entered above, so please don't count this as a duplicate entry, I just had to comment on this guest post! I enjoyed the post and review. Please put my name in the hat. This book does look great!!! I would love to read this one. It sounds fantastic and I love the cover. Thanks for the giveaway! Please enter me in the draw, and thanks for the giveaway! I love wolves!! Thank you for the giveaway. I like the setting of the story, which I rarely come across. I too love a good shifter story. I love that it is set in British Columbia. The mountains, caves and forests seem like such a natural fit for the werewolf. I can't wait to read this books. Thank you for hosting such great giveaways. I love discovering new authors to enjoy, especially when they have some of my favorite paranormal species in them, like werewolves. You know, I read Blood and Chocolate too. There is also a movie of the book with the same title. I liked them both. Thanks for the giveaway. Would love to win this one!!! Sounds amazing!! Bad vampires! I like reading books where the vampires aren't the romantic hero! Please sign me up, sounds like a good read. This book sounds great! Would love a chance to read it! Amazing cover and great description. This series is AMAZING! I am so in love with Suzy Turner's work (just ask her...she will tell you)! I love love love this series. I am so bummed that book 3 is the last one so I see a LOT Of REREADS in my future with this series! I have an ebook of December moon so I would LOVE to win a paperback copy!! thank you! I don't know this author but I would love to know her work! Thanks for this giveaway! beautiful! sounds and looks like an awesome read.